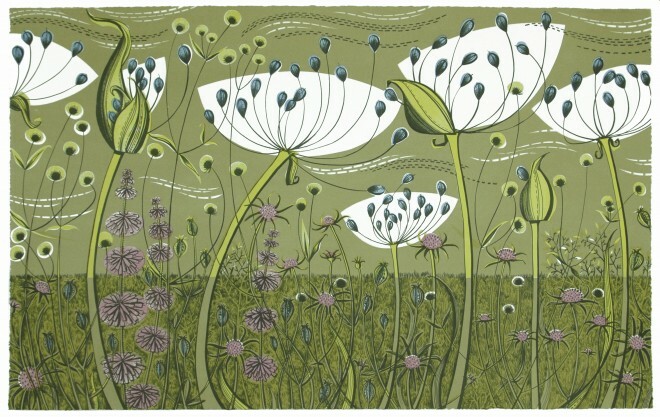 Angie Lewin’s practice spreads across a whole range of media, including screen print, lithograph, wood engraving, lino cut and watercolour, and blurs the boundaries between applied and fine art. 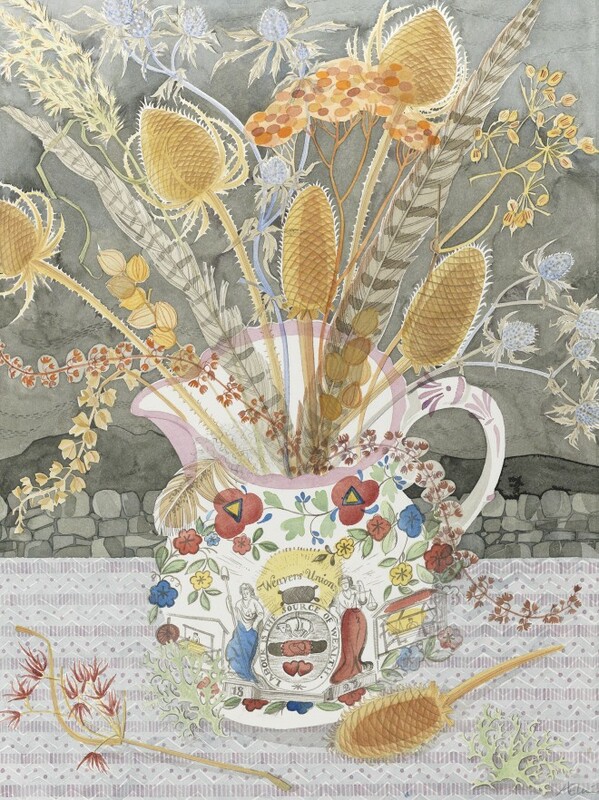 Her primary muse is the natural world, indeed she studied horticulture after working as an illustrator in London, and has never left her engagement with plants. Those found on the cliff tops and salt marshes of the North Norfolk Coast and the Scottish Highlands are often subject matter for decorative and rhythmic designs that dance across the page. 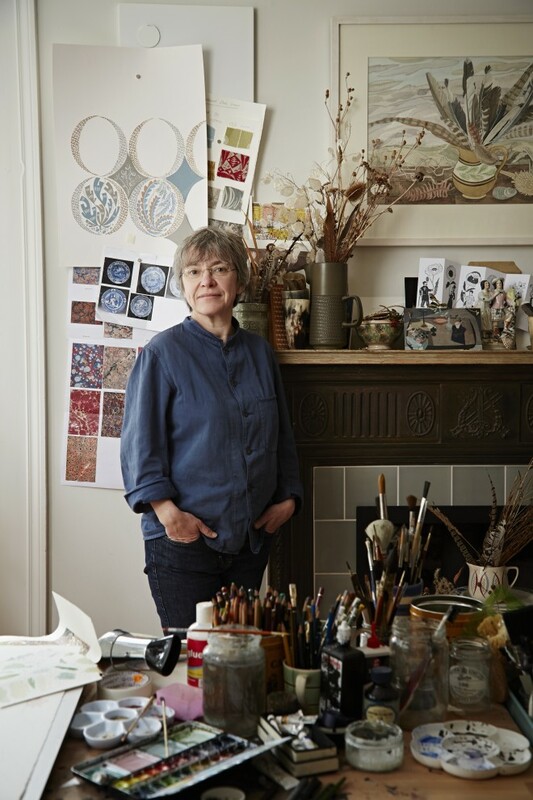 Not only do her bold compositions get exhibited and commissioned as works of fine art on a regular basis, but she is also known to design fabrics and stationery for St. Jude’s, the company she runs with her husband Simon, as well as for Liberty’s. She has also illustrated many books. 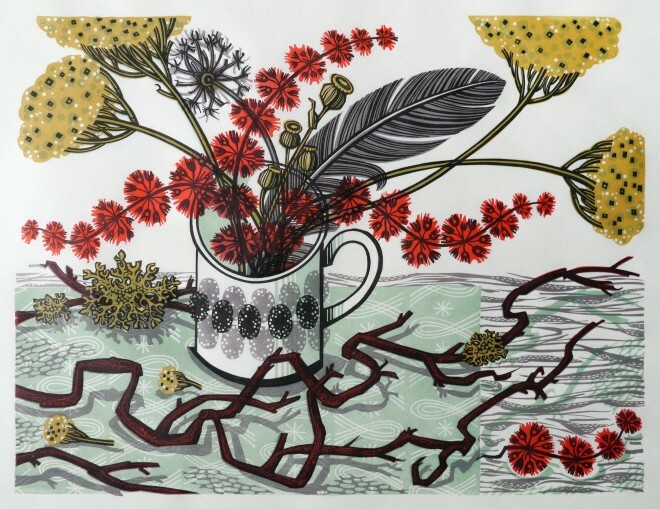 On Sunday 15th November ‘The Masters: Relief Prints’, an exhibition curated by Angie for the Royal Society of Painter-Printmaker’s at the Bankside Gallery, comes to an end. 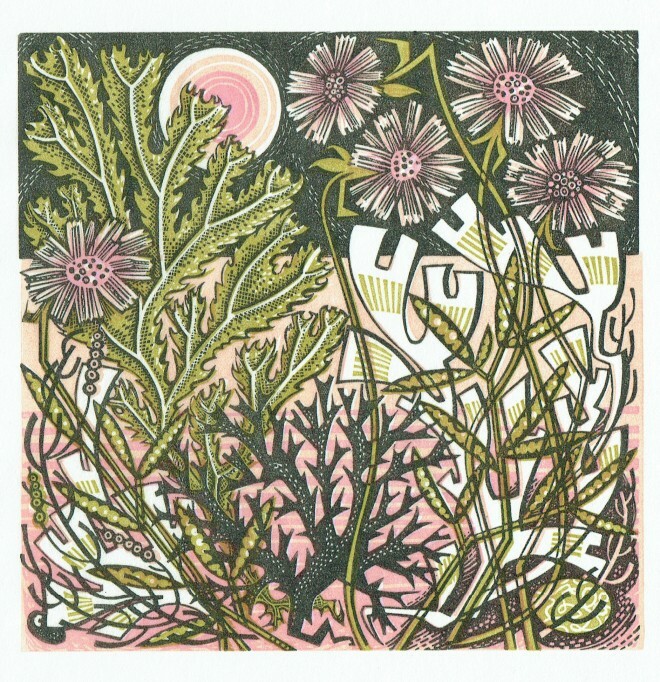 Lisa: You work across so many media, from drawing to inks to watercolour, wood engraving, collage, silkscreen, linocut…the list appears endless! How do you decide what process to work with next and do you ever feel torn between trying something in a new medium and sticking to what is more familiar and comfortable? Angie: My sketchbooks are the starting point for all my work. As I work on an idea, I find that it begins to develop in a certain direction, whether as a limited edition print or a fabric design. One idea may lend itself to becoming a large screen print, another might develop as a small wood engraving. I love trying out new processes. I think working in a new medium and the challenges that arise from this is a great benefit to the way I approach the techniques that I’m so familiar with. Lisa: What piece of work are you most proud of and why? Angie Lewin: I think my choice would vary day by day so I don’t really think I can choose. It seems that each print, watercolour or design that I produce leads on to the next so I’m then excited about creating this. Lisa: Do you have a favourite printmaking process? 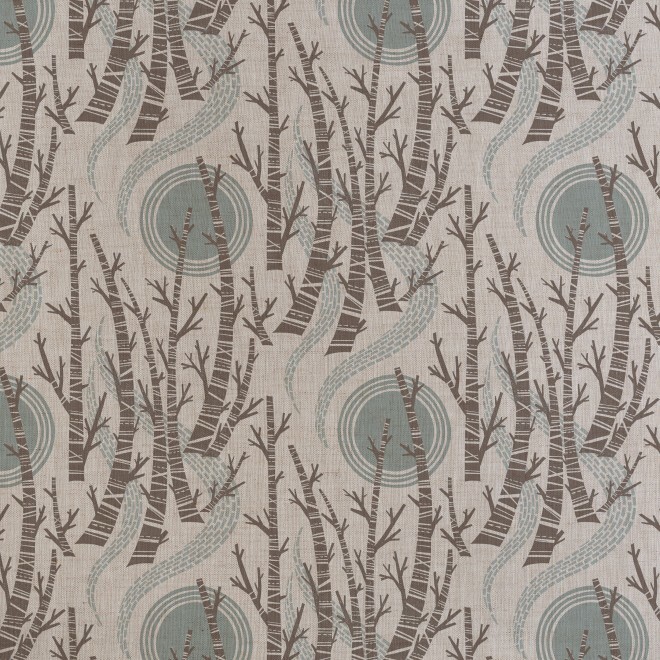 Angie: I enjoy all the print processes that I use as they each have their own qualities and I enjoy the variety. However, I think that if I had to choose, it would be wood engraving as I find the process of engraving a beautiful end grain wood block so satisfying. Lisa: Do you ever have days when you feel utterly uninspired and if so how do you combat them? Angie: I always enjoy being in my studio or working in my sketchbooks. If I am trying to develop a design or I’m looking for colour ideas, I look back through old sketchbooks and often I’ll find inspiration from sketches and ideas that at the time I didn’t pursue but which now relate to current work. Lisa: Do you always know at the beginning of the day whether you will be working on a piece of fine art, an illustration or a fabric pattern? Are there any differences in your approach to making these differing works? 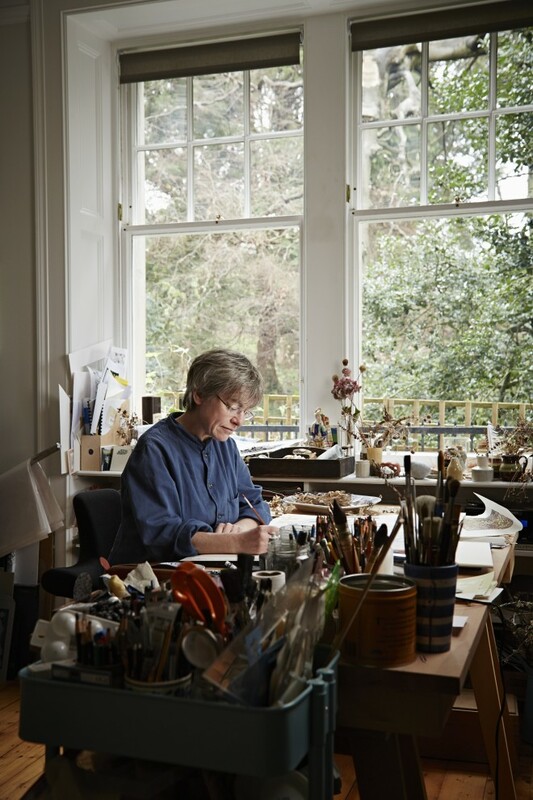 Angie: I do have deadlines whether for exhibitions of prints and watercolours or for designing for St Jude’s. However, my limited edition prints, paintings and my design work all originate in my sketchbooks and so the initial approach is the same. Once I’ve decided whether a drawing will become a linocut or a screen print or will be translated into a fabric design or mug design then the image starts to be developed in relation to this. If designing for a fabric or wallpaper I am more aware of the number of colours I use as this affects production costs and I enjoy the challenge of working in this way. Also I need to design according to the fabric it will be printed onto and the repeat of the design must be considered too. Lisa: What do you consider to have been the biggest breakthrough of your career as an artist? Angie: I think the Yorkshire Sculpture Park exhibition in 2013 as this was my biggest solo show to date. I exhibited watercolours plus a wide selection of the prints that I’ve created since 2003 alongside a considerable amount of new work created just for the exhibition. It also involved designing a range of exclusive products for YSP. Lisa: How do you select your palettes? Angie: My colour palette is inspired by the landscapes and plantforms that I depict. I spend a lot of time out walking and sketching the native flora in both Norfolk and Scotland and the colours found in each of these contrasting places find their way into my prints and designs. Lisa: You have been asked to curate this year’s ‘The Masters: Relief Prints’ exhibition for the Royal Society of Painter Printmakers at the Bankside Gallery. What qualities will you be looking for in the work you hang? Angie: ‘The Masters’ series of annual exhibitions will showcase each of the main areas of printmaking. For this reason I wanted to include prints which demonstrate the diverse range of approaches to the relief printmaking process. 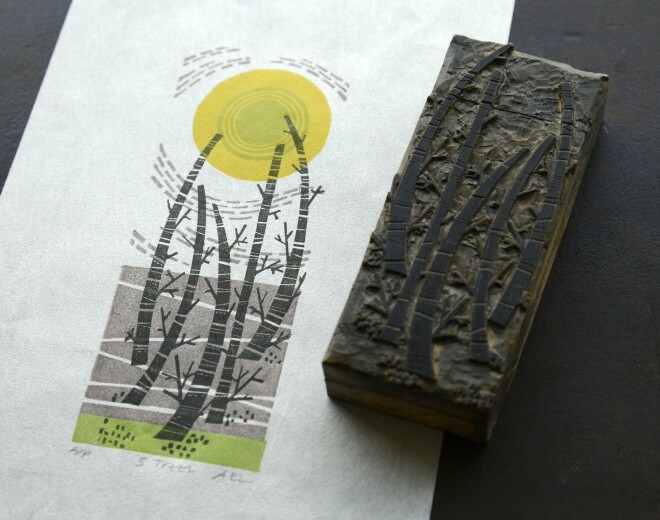 As well as wood engraving, woodcut and linocut there are letterpress prints and prints taken from metal, card and found objects. There is a huge range of scale and subject matter too. Lisa: What are you working on at the moment in your studio? Angie: I’ve just completed a new screen print for Pallant House Gallery in Chichester – an exclusive print that was commissioned to celebrate the opening of their David Jones: Vision and Memory exhibition. I’m now working on a new fabric and wallpaper design for St Jude’s whilst busily editioning wood engravings and linocuts for future exhibitions. I have enjoyed reading more about Angie Lewin. I would love to learn how she makes the varied colours in lino plates and learning woodblock carving is a new pursuit. It would be amazing to see Angie Lewin demonstrate carving a block. She seems a very hard working artist and is one of my inspirations Thanks,Emily. You could subscribe to her mailing list too and hope she might do a demonstration that you could attend!